Most of the building is constructed with blocks of dressed stone (ashlared), but the north aisle is rendered, the roof of which appears to have been raised at some time. All the doorways have been decorated with hoodmoulds and label stops consisting of carved faces, some are badly eroded others are in good condition, possibly having been restored. 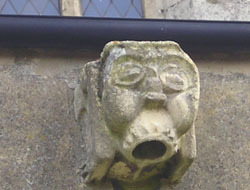 Water from the tower and nave roofs discharges through gargoyles, those on the tower and the south side of the nave are badly eroded but some on the north side are well preserved and are quite grotesque. One of the buttresses on the north side, fourth from the west end, carries the date 1691 or possibly 1621, it is quite well executed but it is not clear whether it carries any particular significance in relation to building work. The original lead of the south aisle roof was decorated with punched outlines of hands and feet and marked with initials, ages and dated 1826. These marks were presumably made by plumbers who fitted the lead. The most elaborate of these markings have been displayed inside the church since 1980 when the old lead was replaced by stainless steel sheeting. A porch like extension on the north side of the church was added in 2007 to 2009. 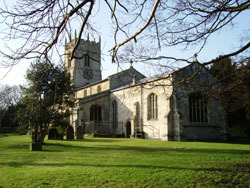 There are two yew trees on the north side of the church and another at the west end. There was an edict of King Edward I that yew trees should be planted to protect churches against wind and weather, there may also be some foundation in the story that yews were planted to supply bows for archers. 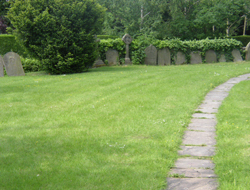 In recent times some of the gravestones have been removed to the periphery of the churchyard to facilitate grass cutting. There are some unusual iron crosses, thought to be Victorian. 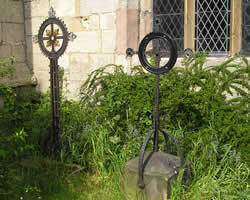 At the main entrance to the churchyard there are a pair of wrought iron gates with iron overthrow and lamp bracket. On the east side of the church graveyard, two seats have been placed near an old tree stump with spring bulbs planted in and around, a place for rest or quiet contemplation. There is a further cemetery separated from the church by the road leading to Rectory Gardens. Here the Portland Stone War Memorial is situated surrounded by iron railings. It reads "Giving thanks to God and in memory of the Gallant men of Beckingham who gave their lives for their country in the Great War 1914-1918" "their name liveth for evermore". It was erected in 1920 and unveiled at a service attended by many ex-servicemen when several wreaths were laid. Many of the headstones are now illegible and some have fallen over. It is a peaceful place, with a seat next to the Memorial for quiet reflection. Both graveyards are now closed for burials. 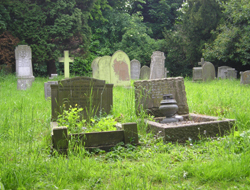 There is a cemetery in use within the village in Beecher Lane which is owned by the Parish Council, click here for details. Click here for Remembrance page.